Groups of 7 or more people are required to pay a €20 deposit per person at check in. the money will be returned at check out after rooms and hostel have been inspected for damage and there were no complaints about the group. In case of other guests complaining about the group, because of noise or other nuisance, the deposit will not be returned and instead will be given to the guests who were disturbed by the group. Groups are required to send an additional e-mail confirming all members are aware of the rules and regulations. children are allowed if there are sufficient people who take care of the rules like responsible parents, guardians, group leaders or teachers. 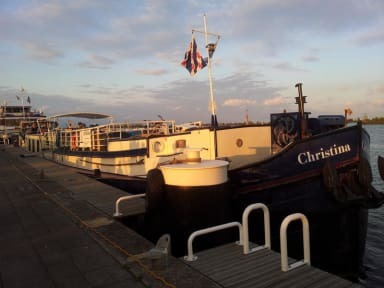 And our boat is located near the Prins Hendrikkade: Oosterdok! We are within a few minutes walk from Amsterdam Central, the Dam, the Newmarket and the Rembrandt Square. Our small cabins have hot and cold running water. The showers and toilets are well maintained and our staff is most friendly. We offer you an enjoyable and welcoming saloon where a royal breakfast awaits you in the morning. Prices include breakfast, made beds and towels. The 4 person cabins are better to be used for 3 adults. Don't take too much lugage in these cabins! The bedlength is 1.90 m.
Whether you choose to venture in to town or enjoy our spacious sun deck to relax we look forward to having you as our guests! !If Checking in between you need to send an email with your arrival time! To keep it cheap for you, bookings in weekend require a minimum of 2 nights. Awesome place to stay. The staff are really lovely and helpful. The breakfast is very decent. I would stay again. For a quick weekend trip, we decided to stay on a different sort of accommodation. Intersail was perfect! waking up to amazing views of Amsterdam from the little window was beautiful. We only stayed for two nights. But it was safe, you get your own key to the boat and to the room. The premises and facilities (shared bathroom, showers, kitchen and dining area and the deck) were clean. The owners had breakfast on the boat too. Since you need to haul your luggage into the boat, pack light. Although I was the only guest, I really enjoyed my stay at Intersail. The location is great- in the heart of the city, but it is so peaceful. The spaces are small, but that is to be expected on a boat. Tommy is a great host and I hope to stay there next time I’m in Amsterdam. We really loved Intersail! The people who Henny & Tommy are absolutely lovely and the location is amazing. For reasons out of our control, we had to leave early and they were completely understanding and helpful letting us check out early. 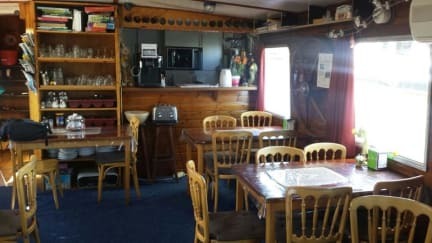 The cabins are small, but there's space to hang out inside the boat and up on the deck - plus if you're spending your time in Amsterdam in your bedroom, you're probably missing out! I stayed in Intersail to have a cheap weekend in AMS and party with friends. For that it was perfect. The top of the boat has a great area to sit out in the run, relax and drink. Slept well and if I was on a party weekend again, this would be on my list as possible options. Respect for the noise rules. Note: If you are planning to stay here with your significant other or spend large amount of time in your room this is not the location for you. Rooms are very small cabins with very short beds. We didn't realize that there was no Air Conditioning, so it got very very warm in the bedrooms at night. Rooms were tiny so it is true when they say the 4 bedroom should really only sleep 2-3. Host was incredibly nice and accommodating. We stayed here for 4 nights, the room was pretty small for the two of us with the bunk beds being slightly small. However the rest of the boat was an enjoyable experience, we were able to have an amazing time out up on deck and meet other guests. The host was incredibly friendly and welcoming, he also puts out a pretty good breakfast. In terms of location, you can't go wrong being only a 15-minute walk from Amsterdam Centraal, and everything is super accessible. not very clean, didn’t feel comfortable enough to walk around with bare feet. The beds were cleanish, but still we put extra clothes on rather than using the blankets. The rooms were so small that it was difficult for two people to stand at once. The beds are tiny. The bathroom facilities aren’t pleasant. The staff were quite nice although.